Set weekly schedules for shutdown and startup times for Instances and VM’s, apply Power Schedules to Instances pre or post-provisioning, apply Power Schedule policies on Group or Clouds, or use Guidance to automatically recommend and apply optimized Power Schedules. Time Zone the Power Schedule times correlate to. Check for Power Schedule to be Active. Uncheck to disable Power Schedule. Slide the start and end time controls for each day to configure each days Schedule. Green sections indicate Power on, red sections indicate Power Off. Time indicated applies to selected Time Zone. To view the Instances a power schedule is currently set on, select the name of a Power Schedule to go to the Power Schedule Detail Page. In the POWER SCHEDULE dropdown, select a Power Schedule. Power Schedule Policies apply to Instances created in the Cloud after the Policy is enabled. Select a Cloud by clicking on the name of the Cloud to go to the Cloud Detail page. Select the POLICIES tab in the Cloud Detail page. Add details about your Policy for reference in the Policies tab. Policies can be edited and disabled or enabled at any time. Disabling a Power Schedule Policy will prevent the Power Schedule from running on the Clouds Instances until re-enabled. 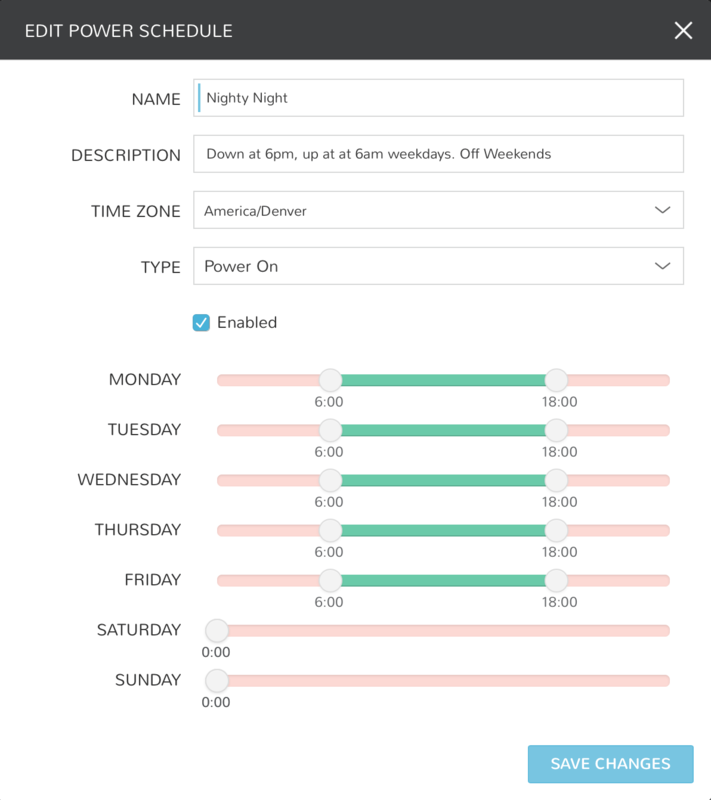 User Configurable: Power Schedule choice is editable by User during provisioning. Fixed Schedule: User cannot change Power Schedule setting during provisioning. Leave blank to apply to all Tenants, or search for and select Tenants to enforce the Policy on specific Tenants. Power Schedule Policies apply to Instances created or moved into the Group after the Policy is enabled. Select a Group by clicking on the name of the Group to go to the Group Detail page. Select the POLICIES tab in the Group Detail page. Policies can be edited and disabled or enabled at any time. Disabling a Power Schedule Policy will prevent the Power Schedule from running on the Groups Instances until re-enabled.